Manushi Chhillar returned India after winning the much-coveted title of Miss World 2017 held in Sanya city, China. It took 17 years for India to win back the Miss World title, which was last bagged by Priyanka Chopra in 2000. The 20-year-old Indian beauty has literally taken the world by storm and recently her video of dancing to Deepika Padukone's 'Nagada' song from 'Ram-Leela'' is going viral, reports Zeenews. The video is of Manushi showing off her immensely polished dancing skills at the Miss World 2017 pageant. With Manushi leading the group of girls, her dance steps stand out totally. Dressed in traditional Indian outfit, Manushi is rocking the 'Nagada' song. Not many are aware of this fact that she is trained in Kuchipudi, and learned the Indian classical dance form from legendary dancers Raja-Radha Reddy and Kaushalya Reddy. Manushi was crowned Miss World 2017 on November 18, 2017, by outgoing titleholder Miss World 2016 Stephanie Del Valle from Puerto Rico. 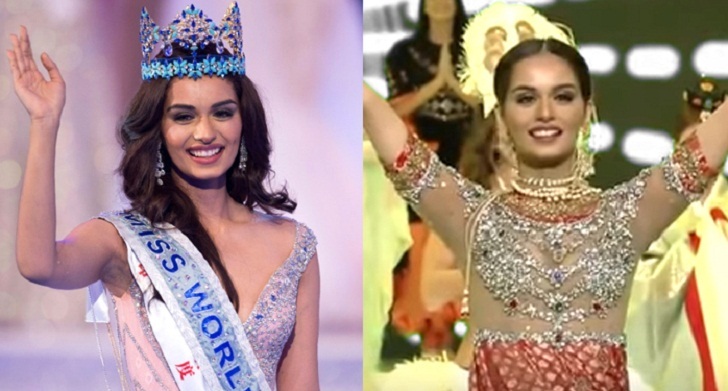 The young and gorgeous Manushi is the sixth Indian woman to win the crown.